The determination of breast cancer stages is necessary for a doctor to take decisions regarding the treatment plan for the disease. In order to find out the stage of the breast cancer, a doctor examines the breast tissues obtained from the lumpectomy or mastectomy procedures. Moreover, tissues of the lymph nodes present under the armpit can also be examined for this purpose. The stage of the breast cancer is usually denoted by a Roman numeral and can range from I to IV. Factors that influence the stage of breast cancer are its size and how far it has spread inside the body. 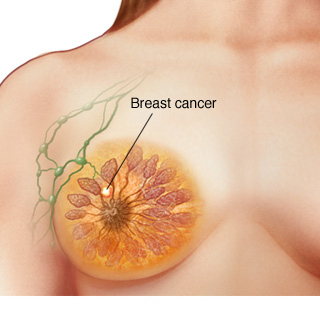 The Stage 0 breast cancer is usually non-invasive in nature. The best example of this stage of breast cancer is Ductal Carcinoma in situ (DCIS). In this stage, there is no evidence of abnormal cancerous or non-cancerous cells in breast or other neighboring tissues. Stage I breast cancer is characterized by the presence of a tumor that is approximately 2cm in diameter and resembles the shape of a peanut. 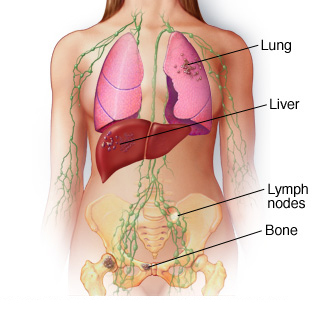 At this stage, the cancer does not spread away from the breast and is yet to affect the lymph nodes. Stage II breast cancer is characterized by the presence of a tumor that has a diameter ranging from 2cm to 5cm. At this stage, the breast cancer might start affecting the lymph nodes but it would not have spread to another part of the body. Tumors more than 5cm in diameter that look like a lime would not involve the lymph nodes whereas tumors less than 2cm in diameter might start affecting at least three of the lymph nodes present under the armpit. 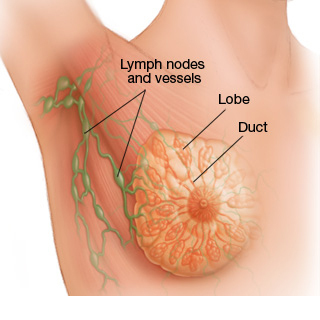 Stage II breast cancer in some cases can have no tumor in the breast but show presence of cancerous cells in three of the axillary lymph nodes. Stage III breast cancer is characterized by the presence of a tumor that is larger than 5cm in diameter. At this stage, the cancer would have started to spread to the lymph nodes present close to the breast. The nodes present in the armpits and the collarbone will start getting affected by the breast cancer at this stage which is also known as locally advanced cancer. The other parts of the body however, still remain safe from the cancer even at this stage. In some cases of stage III breast cancer, the lymph nodes that are affected might be separated from one another while in other cases they might have started growing together above your collarbone. Jessica Bowen was diagnosed with stage III breast cancer and managed to survive by making lifestyle changes that helped her to fight off the cancer. Stage IV breast cancer is characterized by spreading of the cancer to different parts of the body. This stage is considered the most advanced stage of breast cancer and is also known by the name of metastatic breast cancer. Bones, liver, lungs and brain are among the other parts of the body that can get affected by the breast cancer cells. Video: Stage 4 Breast Cancer- Is It a Death Sentence?